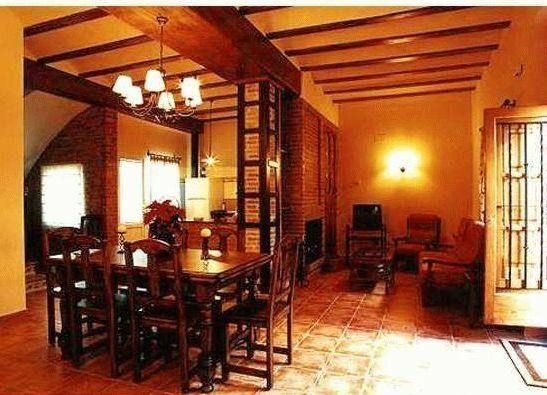 It is a house restored with quality materials respecting its original construction. It is oriented so that the morning sun shines on the left balcony, and that of the afternoon, on the front of the house, having, in this way, a great amount of light. It has the advantage of being cozy. It has central heating throughout the house. With a maximum capacity of up to 10 people (5 bedrooms) the agglomeration that could cause an excess of occupants is avoided. Keeping in this way the tranquility that characterizes Casa El Pozo. For young people, they can enjoy the town because it has many environments. - Dining room integrated with the living room and the kitchen. - Kitchen with fireplace-extractor (that gives breathing to the house), double stack, microwave and hob with oven. In addition, it has a very practical fridge and multiple drawers and shelves. - The patio has a covered paellero for roasting or cooking wood. It has a stack that facilitates the cumbersome work of the wood stove. - The upper floor is accessed by a staircase with typical Valencian decoration. It has a terrace with laundry.